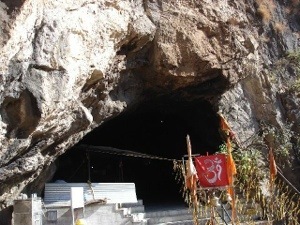 The Famous cave shrine of “Shivkhori” is situated in the District Reasi of Jammu and Kashmir. It depicts the natural formation of shivlingum. The Holy cave is more than 150 metres long & has a 4 feet high Svayambhu Lingum, which constantly baths in a milky lime fluid dripping from the ceiling of the cave. The cave is full of natural impression & images of various Hindu Deities & full of divine feelings. That is why Shivkhori is known as “Home of Gods”. The route from Jammu to Shiv Khori is full of beautiful & picturesque mountains, waterfalls & lakes. ShivShankar.in aims to be the World’s Largest depository of information about Lord Shiva, providing details about temples, stories, publications and photos for your use, and onward distribution.